There’s potential here, there, and everywhere in the world, but there’s a tangible sense of opportunity at Nashville State’s new East Davidson campus. This will be a place where students come to take ownership of their individual talents and prepare for their future careers. 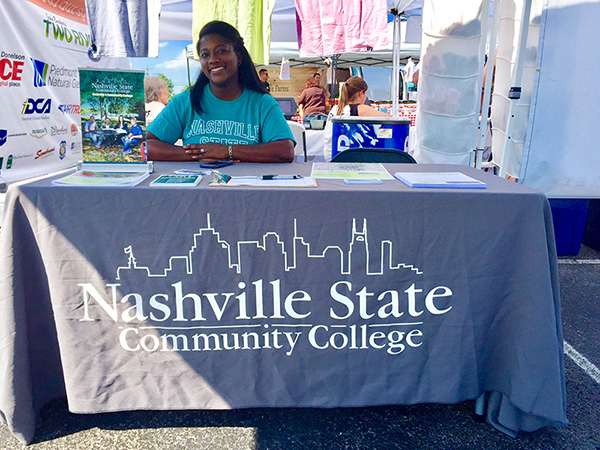 Jamica Hines represents the new East Davidson campus at the Hip Donelson farmers market. Jamica Hines, Interim Assistant Director at the East Davidson campus, along with Southeast Campus Director Kim Silverman, is heading up a series of registration events at East Davidson to put necessary admission information into the hands of potential students. The goal of these events is to give members of the Donelson community several opportunities to talk to faculty and staff about programs of study, learn about financial aid and scholarships, and complete the Nashville State application for admissions. “Davidson County students have a hunger for this information, and they want to go to school,” says Jamica. Future student Brittney Whitehead plans to study Psychology at Nashville State with the ultimate goal of transferring her credits to a four-year university. “The open house brought me in, but it’s nice to have a school that’s only 15 minutes from where I live,” she explains. “I don’t want to have to drive into downtown every day to go to class for a little while, so it makes sense to go to this campus,” Brittney says of East Davidson. Nashville State’s arrival in the Donelson community renews the College’s commitment to provide increased accessibility to comprehensive educational programs and progressive learning environments. “Students deserve to have a campus close to home, regardless of where they live or their zip code,” Jamica agrees. NSCC’s model of planting satellite campuses in underserved areas of Davidson County allows interested students to go to school close to home and work. It’s the goal of Nashville State to integrate higher education into the daily lives of students. The College is prepared to serve students whether they are working adults or teens who just completed high school. 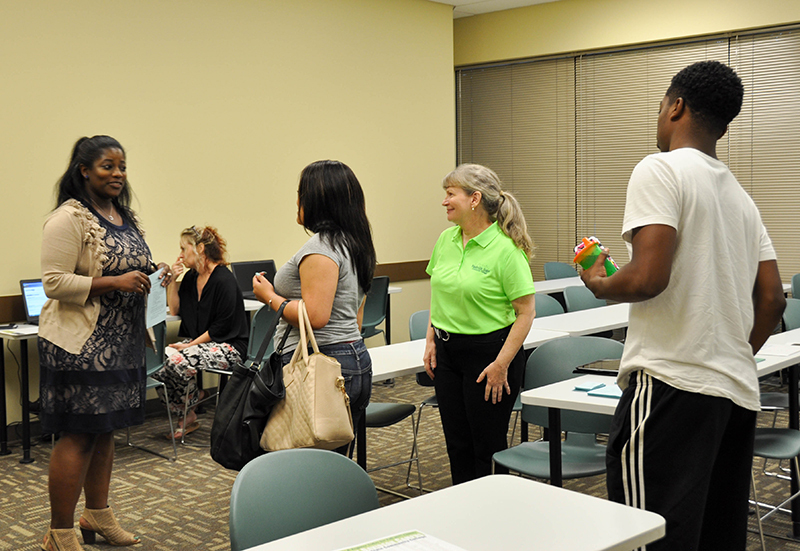 Jamica Hines and Carol Martin-Osorio, NSCC Dean of Students, greet students at an East Davidson registration event. Desray Hargrove, a 2017 graduate of McGavock High School plans to study Computer Information Technology at East Davidson. “I’ve always liked computers, and I’m interested in video game design,” she says. Bryan Alvarado, who graduated with the class of 2017 from Hillsboro High School, is also planning to attend Nashville State in the fall. “My high school had culinary classes, so I’m looking at that program, but I like the idea of Criminal Justice, too,” he says. Jamica also has some advice for high school students who will be graduating next spring: “Make Nashville State Community College your choice. High schools do a fantastic job of promoting Tennessee Promise, but students have to take the next step in preparing college applications.” And Jamica has a plan to help students make the transition from high school to college. “I want to get in the high schools, and I want students to get to know me and see that I care. It means a lot to build relationships and let students know that somebody wants to help them and guide them,” she explains. Jamica is seriously passionate about helping students mine their unique talents to reach their full potential. “We have a vision to help students who would get lost at a four-year university. We want to help them get comfortable in the college climate,” Jamica says. The smaller class sizes at Nashville State help students build relationships with their instructors, but the spread of six different campuses can still be overwhelming to some. At satellite campuses like East Davidson, the staff, not just the faculty, are able to build close connections with their students, too. “Nashville State sees students who are more successful in college than they thought they could be when they were still in high school. We’re prepared to help our students in whatever way we can,” she finishes. The East Davidson campus of NSCC has the potential to be the kind of college that so many people are looking to find, and Jamica Hines is determined to see that potential develop into a reality. There’s still time to attend a free registration event at East Davidson and meet with staff like Jamica who want to help you become a student at Nashville State. For more information about the East Davidson campus, visit their website or check out their social media. They’re on Facebook, Twitter, and Instagram. You can reach the East Davidson campus by email at eastdavidsoncampus@nscc.edu or by phone at (615) 353-3180. Have an idea for Stories of State? Share your student, faculty, program, or other news of note with Emily Evans via email at emily.evans@nscc.edu or by phone at (615) 353-3222.